Clock Tower, Cathédrale de Immaculée Conception, Giant Tortoises and Coco de Mer in the Mont-Fleuri Botanical Gardens. Today I made a round trip in the capital city Victoria. Starting from the bus station in the Palm Street I walked to the Cathédrale de Immaculée Conception and then to the Sir Selwyn Selwyn-Clarke Market. Close-by there is also a Hindu Temple, but unfortunately it was more a building site. On the way to the Mont-Fleuri Botanical Gardens (my first contribution to wikipedia.org :o) of the Ministry of Environment I past the centrally located clock tower, which looks like the Big Ben in London. 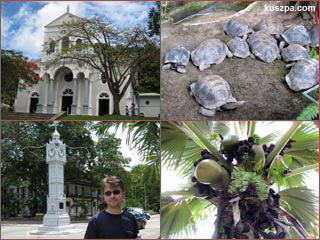 The Botanical Gardens is not very big, but they have some of the famous Coco de Mer palms and Giant Tortoises.